Cut a 2-inch piece off the end of a loaf of dough and set aside. Stretch and roll the rest of the loaf to about 17-inches, forming a narrow tail and leaving a broad head. Pull this end into a long, flattened mouth. In the middle of the gator, cut two 3-inch lines horizontal to the body. Cut in the middle of each line and pull each stump out to form legs. 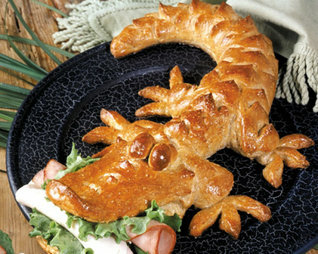 Now place the gator body on a large sprayed baking sheet. With a small knife, slice the mouth open about 4-inches. To keep it open, slide in a folded piece of aluminum foil. Roll up additional foil into log shapes and insert between folded foil. Form an upturned ridge at the end of the nose. Divide remaining dough into 6 sections. Roll 2 sections into oval teardrops for eyes. Poke 2 holes very close together in top of gator head and drop eyes into the holes. For the feet, press 4 sections into triangles and cut toes. Place feet under legs. With sharp scissors, clip jaw, back and sides of gator. Brush well with egg. Let rise for 15 minutes. Bake at 350°F 25-30 minutes. After 10 minutes open oven and gently press eyes together. Remove foil after gator has cooled completely. Prep Time: 15 min (not including thaw time) Bake Time: 25-30 min A clever way to serve an ordinary sandwich!